There was 7 in stock on 22 April 2019 at 08:30. The Battlax BT-45 is a touring type tyre offered in both H and V rated speed symbols. Battlax BT-45 gives all-round street performance, with the emphasis on riding comfort, long mileage and wet performance, all of which are designed with Bridgestone's latest tyre developing technologies. With its comprehensive tyre sizes, Battlax BT-45 replace Battlax BT-35 and BT-17V. 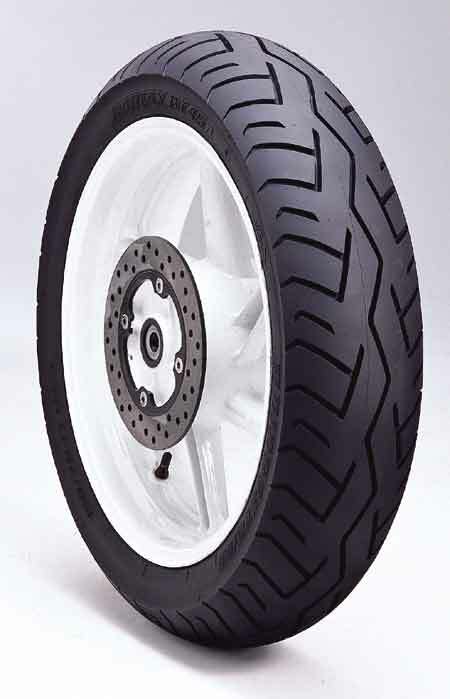 The Battlax BT-45 rear tyre contains Dual Tread Compound DTC . The centre compound secures long mileage and durability, while the tread edge compound secures grip and traction in corners. Also, Battlax BT-45 compound contains Silica for additional wet performance. The newly developed zigzag centre grooves promise high-speed stability. The smaller, directional grooves in the front tyre effectively remove water for wet performance. Designed with CTDM, the unique sidewall profiles of Battlax BT-45 give high-speed stability and riding comfort with its cushion effect. The large crown radius also contributes to stability in high-speed touring. Link back to Bridgestone First Page.